Students will be provided with a crochet hook and a selection of yarn to practice crocheting chains in a magic circle. Then they will expand on that to create sphere and tube shapes that will become the foundation of the body parts needed for a crocheted creature. Poly-fil, Snap eyes, snap noses and eyelash yarn will also be provided for embellishments and finishing. 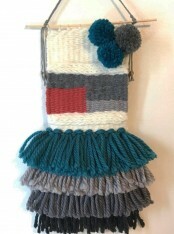 In this class students will discover how fun and easy it is to create with wool fleece. 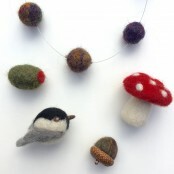 From simple wool beads to intricately detailed small figures, the creative possibilities are endless! Students will leave class with new felted creations plus the tools and knowledge to keep on creating more at home. The class begins with a brief history on knitting. 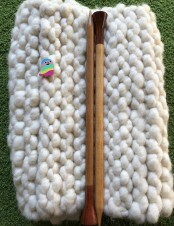 We learn the basic purl, knit and stockinette stitch. Students have the opportunity to complete their very own scarf in class and also learn the verbiage of beginners knitting! Students will be supplied during class with their own wood lap loom made in the USA, yarn, warp thread, and weaving needles to keep. We will learn 5 stitches that will allow the student to continue with their own creative outlet on future weavings! Students will be given the husk of a creature to stuff and close before adding limbs and accessories. Snap eyes and snap noses will also be offered. A variety of needles, threads and faux fur will also be provided for completing the project as well as a sewing machine or two for those who would like to use them. This class is an opportunity to take used natural fiber clothing (silk, cotton, linen) such as shirts, skirts, scarves, even (pliable) handbags, deconstructed hats and shoes -- and make them into transformed 3-d artwork. 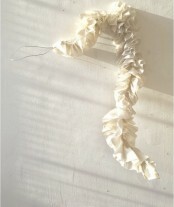 We'll be adding wire and wax for support to make freestanding encaustic sculptures. An introductory class into the techniques and history of Japanese sashiko stitching to repair and decorate fabric. Students will leave with a patch or a wrist cuff.